For years golfers have been categorized as either a better player suited to forged irons or a novice more suited to a game improvement, cavity-back, distance iron. Callaway are trying to change that trend, by combining the best of forged and distance in their new Apex iron. The Apex name comes from Ben Hogan Apex irons that were around in the 1990s. Whilst Callaway sold the Ben Hogan brand in 2012, they held onto the Apex name. The 2014 Callaway Apex irons feature a forged steel body with a ultra-thin, strong steel face. Combine that construction with a moderate cavity-back design and you have an distance-gaining iron with the feel and finish of a better-player forged iron. When asked to describe the Apex iron in one sentence, Callaway said "It combines technical power with the feel, precision and beauty you get with a forging." The combination of the two steel materials is the real key behind the Apex irons. The thin Carpenter-steel face is the same material Callaway used in their popular X Hot fairway wood range. 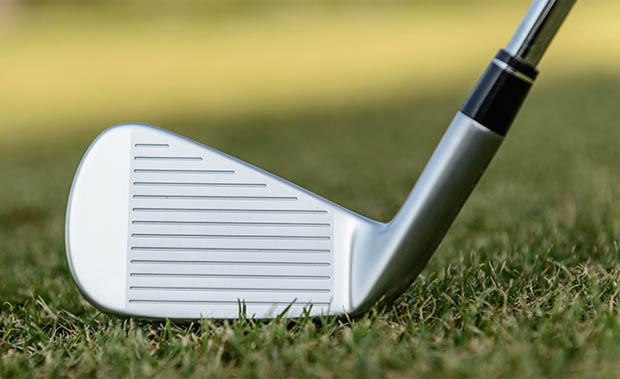 By adding this ultra-thin, very strong steel face to a forged steel body, Callaway believe they can increase ball speeds by 1-2 mph whilst providing the soft, forged feel that better players prefer. Interesting Callaway told us that each irons has to go through a 40-minute milling process to carefully add the face to the forged body. This is done to specifically position the weight in the Apex iron where Callaway want it, low and deep. If this combination of forged and distance is so good, why haven't Callaway done it before? Actually, they have. In 2009, Callaway released the Diablo Edge Forged iron which offered a forged, cavity-back, distance iron. The Callaway representatives we spoke with described the new Apex irons as "Diablo Edge Forged on steroids." In addition to the two different types of steel, the Apex irons also features tungsten and polymer. Tungsten is added to the sole of the 3, 4 and 5 irons to add more weight, lower on the club. By adding this addition weight, Callaway can bring the centre of gravity even lower and improve forgiveness to promote higher-launching long irons. A black polymer material and Apex badge on the back of the club work together to reduce vibrations. 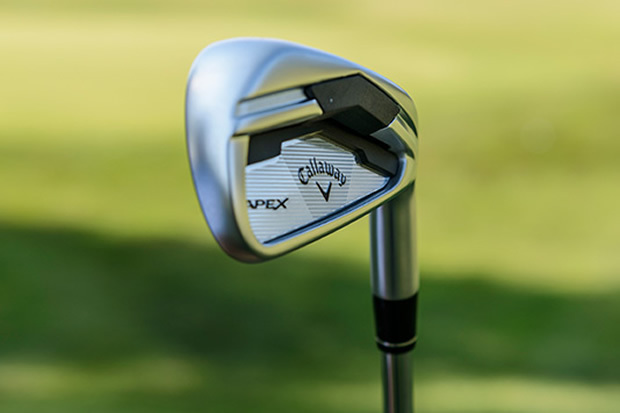 Compared to some of Callaway's most recent irons, the Apex irons will offer more forgiveness and launch than the X-Forged irons in a profile that is slightly thicker. In terms of size and profile they will sit between the more recent X Hot and X Hot Pro irons. The Apex irons also sees a new groove design from Callaway. The new, wide spaced grooves are cut at an angle of 30-degrees and designed to deliver more spin and consistency from a variety of lies, especially out of the rough. Beyond the new head design, Callaway have also placed a high emphasis on the shaft, releasing the Apex irons with a choice of premium steel and graphite options. The True Temper XP95 steel shaft is a lightweight (93 or 95 grams), high-launching shaft. Within the shaft, the steel walls vary in thickness. The thickness is thinner nearer the grip to improve feel and thicker near the clubhead to offer better control and accuracy. As for the graphite option, the UST Recoli shaft is again lightweight (69 to 82 grams) but offers a higher flex point to improve workability and feel. Callaway's Luke Williams introduces the new Apex irons. How Callaway combined distance into a forged iron. Explanation of the materials involved in making the Apex irons. How the cavity design helps get the ball higher/further.